If a child were looking for convincing proof that magic exists in the world, and that one need never relinquish the passions of youth, that kid would have to travel no further than the local candy store. To visit was to enter a felicitous alternate reality, a planet without hardship or heartbreak, a modest temple to pleasure. Its cases were organized with neat rows of candy, including a cornucopia of chocolate creams; I’ve yet to come across a better, lighter, vanilla cream. And then there were the store’s trademark red and white checked boxes loaded with their signature wafer-thin chocolate mints. These were delicate sandwiches of dark chocolate and green mint cream. And they suggested a sensibility no less exacting than Vermeer’s. That would be owner Al Schwartz. When Schwartz’s closed its doors in the early 80’s it felt as if the doors to my childhood had also shut behind me; even though I’m happy to report that Mr. Schwartz’s family continues the noble tradition of candy making, now in its 79th year, in Carle Place on Long Island. While nothing could quite replace Schwartz’s and that Mary Poppins sense of serendipitous wizardry, I’ve found a more than suitable upstate substitute. It’s called Vasilow’s and it’s in Hudson, NY. Best of all, it’s apparent from the moment you set foot in the store that the Vasilow’s – Kate and Jim – have a sense of the responsibility that lies in their hands; to marshal the transporting power of a candy store, not just the smells and tastes but also the aesthetics, the theatrics. It’s no accident that this commentary comes the week of Valentine’s Day. But the message that Vasilow’s, with its old-time cases and patterned tin ceiling, imparts is that treating yourself, as well as your friends and loved ones well, very well, should be a year-round habit, almost a regimen. Jim Vasilow has done his best to reproduce the candy store and soda fountain that his grandfather and great uncle, at the time recent arrivals from Greece, operated on Warren Street in Hudson from 1923 to 1969. I neglected to ask him how much he was paid, undoubtedly in candy. Among the memorabilia the resurrected Vasilow’s has collected are some of the original store’s signs – ice cream sodas were 35 cents – and a well-thumbed bi-lingual candy cookbook in both English and Greek. There’s no soda fountain but I’m pleased to report that business is good even though Vasilow’s is ever so slightly off the beaten track. No longer on Warren Street but at 741 Columbia Street. Kate described their customers as a lucrative mix of locals, weekenders and corporate clients. And it’s easy to understand why. I’d dropped by to purchase Valentine’s hearts for my family, the assorted one-pound box costing roughly half of what it would in New York City. Jim got into the candy business shortly after getting out of the tool distribution business and “hating every minute of it,” he told me. 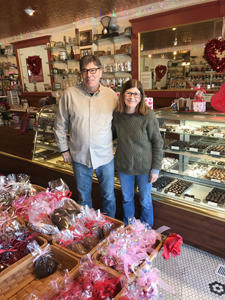 There was little of the original candy store left – just a couple of copper kettles and a few chocolate molds. He’s also recreated Vasilow’s inlaid tile floor. Most significantly, with his grandfather gone Jim had no guide or mentor to teach him how to master the art of making chocolates and candies. So he set out to learn, crisscrossing the country taking classes. The couple opened the reincarnated Vasilow's in 2002. Since that time tastes have changed. At first, Kate told me, they sold 70% milk chocolate and 30% dark. Those numbers have now flipped, dark chocolate considered a healthy treat. Dark chocolate is also part of the popular Keto diet. I don’t see why one has to choose. While I also prefer a dark chocolate cream -- the bitterness of the chocolate setting off the sweetness of the raspberry, orange or maple filling -- a milk chocolate cherry cordial overloads the brain as few activities that come without emotional complications can. Christmas is the busiest season, with Valentine’s Day and Easter – Vasilow's has a collection of bunny molds in various shapes and sizes as well as solid and hollow – coming in a close second. They even have an older customer who returns once a year to have the same pound-and-a-half Valentine’s heart replenished for his wife. “We’ve even done repairs,” Kate told me. But only a fool would consider a candy store just for special occasions. While I’m not recommending it become a staple of your diet, it has a coolly efficient way of instantly helping life rise above the mundane. Kate reported that their almond butter crunch and peanut brittle are very popular. And their chocolate truffles can be a charmed addition to a balanced diet. And if you’re one of those to whom locally sourced ingredients is important, I heartily recommend Vasilow’s cacao maple vodka truffle. It’s made from vodka from Olde York Farm Distillery in nearby Claverack, NY.